Mean, giant crushing machines are returning to the WFCU Centre this year to put to rest old Pintos and Impalas. Monster Spectacular is coming back to the WFCU Centre for one show on Friday May 14th 2010. 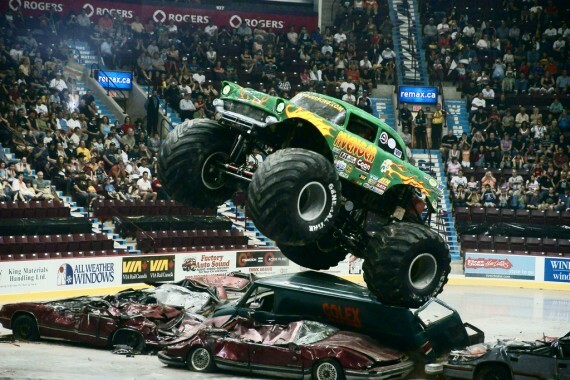 Monster trucks Bounty Hunter, Avenger, Iron Outlaw and others will rip up the pavement inside the Windsor Family Credit Union Centre’s main bowl as they jump, fly and crush cars and vans. The mean machine show was first seen in Windsor at the WFCU Centre last April (you can check out pictures here). Tickets will be on sale this Friday February 19th at 10AM.